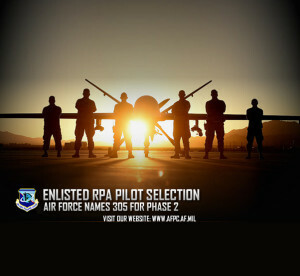 Air Force officials have chosen 305 active-duty enlisted Airmen for the next phase of the Enlisted Remotely Piloted Aircraft Pilot Selection Board process as part of a deliberate approach to enhance the intelligence, surveillance and reconnaissance mission. “We have an incredibly talented pool of enlisted Airmen, and we’re confident that this rigorous selection process will yield excellent enlisted aircrew who will continue to provide combatant commanders with the ISR they need to win today’s fight,” said Senior Master Sgt. Rebecca Guthrie, the career enlisted aviator assignments manager at the Air Force Personnel Center. The selection board process mirrors that of the Undergraduate Flying Training Program as closely as possible. However, AFPC received more than 800 applicants whereas the UFT normally nets about 200, necessitating a phased approach that generated the initial list of potential board candidates. Those selected in Phase 2 answered the July call for nominations and completed both the Air Force Enlisted or Officer Pilot Qualifying Test and the Test of Basic Aviation Skills with qualifying scores. 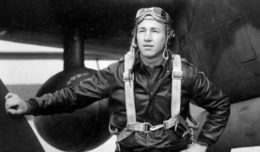 Those scores were then combined with an applicant’s flying hours to generate a pilot candidate selection method score (PCSM). If high enough, the PCSM, combined with other eligibility factors such as assignment limitation and availability codes and retainability, enabled an Airman to advance to the next step in the application process. Candidates selected in Phase 2 will need to get the required medical screening, commander’s recommendation and submit completed application packages to AFPC no later than Dec. 16. Medical waivers are due by Jan. 27, 2017. 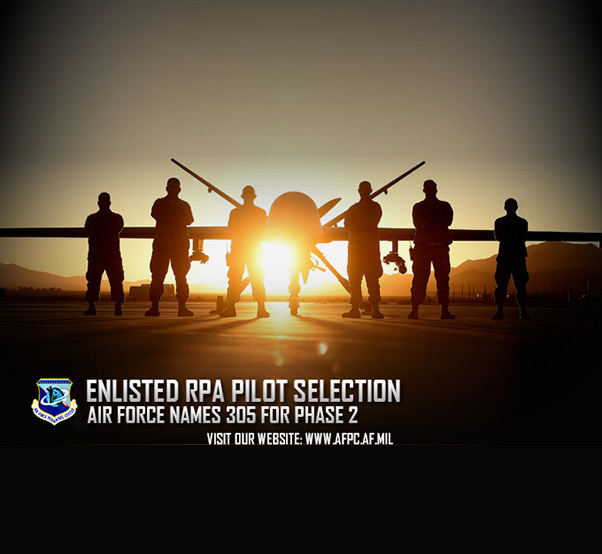 The Enlisted RPA Pilot Selection Board meets Feb. 6-9, 2017, with results to be released later that month.